Original London Cast, 1953 (Columbia/Sepia) (1 / 5) It sounds like ideal casting: the lovable British comic Bobby Howes as Ben Rumson and his up-and-coming daughter Sally Ann Howes as Ben’s daughter, Jennifer. But this cast album shows neither performer at best advantage. The recording is in medley form — one chorus each of such songs as “All for Him” and “There’s a Coach Comin’ In” — and adds up to barely 13 minutes. Sally Ann Howes sounds a little raw, with stilted line readings and uncertain top notes. As her love interest, Ken Cantril is off pitch and doesn’t sound remotely Mexican. The one selling point is some tasty dialogue not heard on the Broadway album. 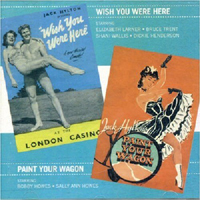 (Note: The Sepia CD compilation includes selections from Wish You Were Here and Guys and Dolls as performed by members of the original London casts of those shows.) — M.M. Film Soundtrack, 1969 (MCA) No stars; not recommended. There are not quite three minutes of fine singing here, when Harve Presnell in the role of “Rotten Luck Willie” sings “They Call the Wind Maria” in the pouring rain. The rest is torture. Alan Jay Lerner and André Previn wrote five new songs for the movie, each more dismal than the next. All right: “A Million Miles Away Behind the Door” is an almost-good ballad, but Anita Gordon, dubbing for Jean Seberg, phones it in. When Clint Eastwood sings “I Still See Elisa” in a toneless, hoarse tenor, he sounds even less engaged than Gordon. Lee Marvin’s “Wand’rin’ Star” is sleep-inducing, and so is Nelson Riddle’s conducting. This album is for masochists only. — M.M. Encores! Cast, 2015 (Masterworks Broadway) (4 / 5) The 2015 New York City Center Encores! 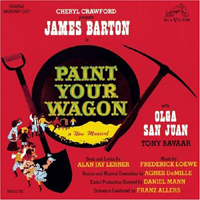 staging of Paint Your Wagon revealed a less-bad book than generally believed, and a rip-roaring score that has long deserved a far fuller performance than the one heard on RCA’s original Broadway cast album. It finally gets that performance here, with a couple of songs that are completely missing on the 1951 recording, longer versions of “Wand’rin’ Star” and other standards, and several flavorful Trude Rittman dance sequences that make you wonder what Agnes de Mille was filling the stage with. The casting, while not ideal, is pretty good. Keith Carradine as Ben doesn’t top the role’s creator, James Barton, but he’s pretty characterful, and while I prefer Olga San Juan’s throatier belt, Alexandra Socha acts Jennifer excellently. 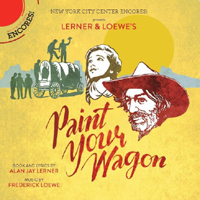 Justin Guarini is a romantic, persuasive Julio, and Nathaniel Hackmann sings the heck out of “They Call the Wind Maria.” A bonus track offers a performance with piano accompaniment of a cut song, “What Do Other Folk Do?”, based on an idea that Lerner and Loewe later put to better use in Camelot. 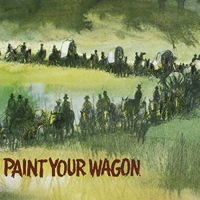 The score of Paint Your Wagon is superb, with one of the highest testosterone levels in the annals of Broadway, and this long-overdue recording is one you’ll want to replay as soon as you’ve heard it. — M.M.